Audio For Drinking: "Time was running out. I had to make a move." "Time was running out. I had to make a move." With only one mis-step in my attempt to post every day this month, I've at the least impressed myself just given the time commitment right in the middle of the holidays, a new job and moving. In fact, with my internet possibly being shut off before the new year, I'm going to double up on some entries to my favorite songs this year to make sure I get to them all. It works out well for today's piece, which is about two incredibly consistent musicians who do the guitar-based indierock thing and who have found more success for their music overseas, but whose records I know I will always buy the day it comes out. Another things that both artists have in common is their nomadic, having challenged the notion of building a supportive local fanbase by moving around frequently. If you're able to pull together both their catalogs, I think you'll predictively find this may have caused some pleasing non-conformity and nuanced changes in their sounds. Cass McCombs debut album, titled A still remains one of my favorite and most listened to albums of the past several years and in 2007 he very quietly released Dropping the Writ to the usual praise and unfortunate lack of hoopala. Meanwhile, when I last wrote in this blog I declared Josh Rouse's Nashville my favorite record of the year. Rouse has been putting out albums on an annual basis for some time and his latest opus of hipster soft rock was called Country Mouse City House. Cass McCombs in many respects defies music cliches. He doesn't come off as a conventional singer-songwriter type, which is not to say he isn't introspective, but there is a certain lack of ego. Perhaps it's that he's not painfully expressive like most songwriters. His music can simultaneously come off as dark and moving while dropping some creative humor, but I also wouldn't peg him as art-pop. His crooning style may be most akin to certain British pop stars of the eighties. The chameleon thing has suited him well, leading to successful touring stints with the folksy Palace, the more abrasive Blonde Redhead and the consumer-friendly indierock of Modest Mouse. If forced into a comparison though I'd say the left-field lyrics and artistic fancy might suggest a modern-day Donovan. "That's That" is the lead single off of Writ and is one of the most accessible pop ditties he's put out there. Cass McCombs - download "That's That"
Josh Rouse sounds awfully calm on his songs for a guy that's been jumping some hurdles the past few years. After making the transition of emerging Nebraskan songwriter turned nomad to critically-acclaimed Nashville player whose records consistently collected "near-classic" tags, Rouse went through a divorce, kicked a drinking problem and moved to Spain, starting his own record label. Like McCombs, you can hear that Rouse spent his teens listening to some choice acts like the Smiths and the Cure and the twangy impact of the friendships he made in Tennessee are equally unavoidable. "Hollywood Bass Player" is a buoyant pop tune that brilliantly seems to make light of his bouncing around the world while playing music. 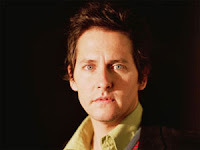 Josh Rouse - download "Hollywood Bass Player"